The Fox Chapel Ski and Board Junior Program makes skiing and snowboarding more affordable for families of all sizes! 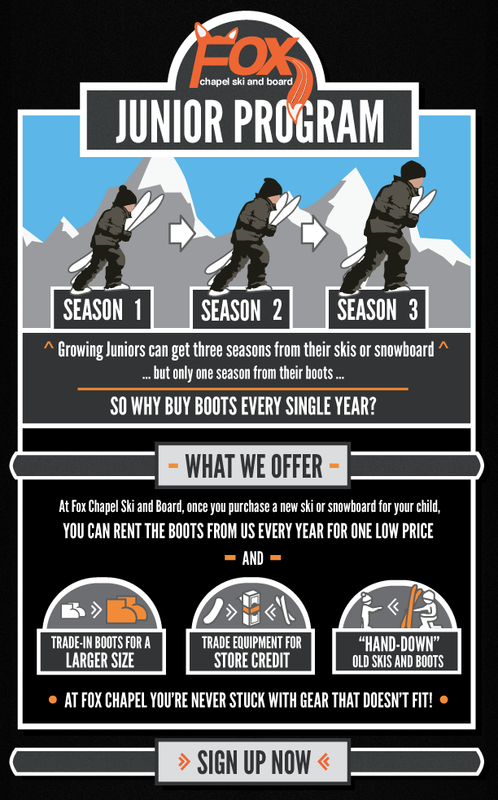 Junior skiers and snowboards grow out of their boots much faster than they grow out of their skis or snowboard, and junior ski boots can be expensive! Parents spend as much as $199 for boots that your child may grow out of after only one season! Our Junior Program families never get stuck with boots that don't fit because Junior Program Families have the opportunity to rent ski boots for only $39.95 for the entire season. Anyone who purchases their junior skis from Fox Chapel Ski and Board is automatically enrolled in our Junior Program and can start taking advantage of the savings this season! We offer Junior Program families more affordable binding service and equipment tuning than any other ski and snowboard shop in Pittsburgh so you can save even more! After your child grows out of their skis or snowboard - usually after two seasons - you can trade in your child's old skis and we'll give you a credit towards the purchase of new equipment. You can also Save $90 or More when you transfer your child's old bindings to a new ski or snowboard! So what are you waiting for? Come down to Fox Chapel Ski and Board today and see how more than 1000 families in Pittsburgh are saving with the Fox Chapel Ski and Board Junior Program - It's just one more reason why Fox Chapel Ski and Board is your one-stop Ski and Snowboard Shop in Pittsburgh!